2.) It picks up after the admittedly largely forgettible and throw-away beginning. 3.) It appears to largely be an interesting tech demo with some pretty cool giant monster vs. giant mecha fight scenes added. Either way, with the whole thing being only 24 minutes long you won't waste a lot of time watching it. 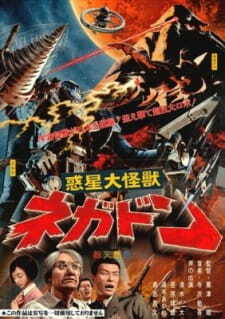 The story is largely throw-away and just an excuse to get a giant monster and giant robot fighting. In the year 2025, mankind has expanded to 10 billion persons and is exploiting Mars for natural resources. A large cocoon is brought back from the red planet, which escapes from the space ship holding it and lands in downtown Tokyo. Meanwhile, an old man is remembering his lost daughter who died during an accident during the construction of a large machine he designed for terraforming. As he watches the news, a large monster emerges from the cocoon and obliterates the army. He decides to activate the machine, which turns out to be a giant mecha, and flies into action as the only remaining thing standing in the monster's way. Yes, it's admittedly cookie-cutter, but hey I guess it's besides the point. The sound is sharp and crisp, but there's a lack of any memorable BGM or other audio mood modifiers. The characters are pretty stock and one-dimensional, perhaps unsurprising given how much needs to be fitted into 24 minutes, and also perhaps because it's besides the point - you watch this so you can see CGI giant monster fight CGI giant mecha!